The 2011 Cybils awards are in full swing. I bought a boatload of e-books before I left on vacation, so I'm not too terribly far behind in reviewing YA SF/F titles, but I'm certainly far behind on blogging about them. When I knew I had the privilege of being a first-round judge for a second year, I set aside a dozen almost-finished titles and started in on the (something like) 180 nominated books for this year. I've hit about a third of them so far, but my personal judge-o-meter wants to see as many as possible before we have to narrow down to a finalist list. Last year, that was about 80% of the nominations in my category, which means I need to read about 80 more books in the next two weeks... I have about 50 stacked up and ready to go, though, so that shouldn't be too hard. Thank you to the publicists and publishers who've so thoughtfully provided copies. I know that only a few will be shortlisted and that there can only be one winner, so it's fantastic to see your support for your authors. This is always an interesting task, because for most of the year, I'm not reading so comparatively. I mean, I AM; I'm always evaluating, thinking about how this book has appealed or might appeal in the future, and so on. But creating a short list of books that fit the award criteria--as a committee--is not quite the same as if I were creating a short list of books that hit all my buttons. Because I won't be able to blog about everything I've read, no matter how hard I try, I'm planning to do some themed posts, grouping books into like reading experiences. I was the very, very fortunate recipient of a trip to Australia this month. I had a fantastic time! I have about 1,000 unread e-mails! I have pictures to label, out of order, because I e-mailed some from my phone when I could find a wireless hotspot! I'll post some travelogues here, and please feel free to skip if you're only here for books. While I was gone--well, the month before and after a conference are some of the busiest of the year. There are a lot of late nights and early mornings. There's a lot of figuring what can wait until later and what has to be done now. 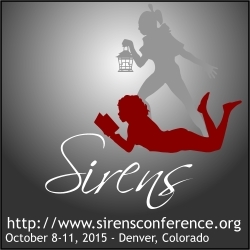 One right-now thing, that went up just as I left, was the 2012 update for Sirens, a small conference focused on women in fantasy. This means books and media, for all ages, written or created by or consumed by women. Next year's event will be held outside Portland, Oregon, on the Washington side of the Columbia River, and the theme is "tales retold," meaning fantasy connected to existing stories. Two of the guests of honor are Malinda Lo and Kate Bernheimer (I'll have to keep mum on the third for now, sorry). Narrate Conferences has been working on a YA conference for a while, but the economy has been miserable, and in the meantime, I've found these retreat weekends to be really invigorating, smart, and thoughtful, and a great way to connect with fantasy that, being a YA-person, I wouldn't necessarily think to pick up on my own. And, what I meant to say from the get-go, is thank you to the staff who worked so tirelessly through October and November, and who made it possible for me to go on a vacation. Photobucket went to a commercialized photo service, so I had to wipe everything out of there. I'm trying to figure out what to do with my photos now. I'm enjoying Windows Live Essentials as an on-computer editor, because it is one click to some interesting features, like straightening up photos and the like! Tip: Check the expiration date on your sunscreen before you hike two hours to a deserted, shadeless beach with a very inviting swimming area. Overland Equipment's Donner bag is handy for carrying just enough and it has handy side pockets for water bottles, tickets, and small electronics. It's almost the end of the year! I'd like to write a big long post on giving to charity, but I'll just give you these tips: 1) Give because you want to give and because you support the charity's mission and admire their work; your personal income and expenses might not mean you actually get any tax credits, 2) Give as directly as possible; small, local charities can use your help, and some workplace giving programs take HUGE percentages off the top, 3) Give unrestricted money as often as you can; charities can direct it to areas of most need, and won't have to deal with things like disposing of unusable items (think about how many too-old or too-dirty for use sofas Goodwill probably gets every year), and 4) consider offering your time and/or services, either for a short-term program or a project. The last probably isn't tax deductible--the cost of your time or services isn't--and you may be turned down, because it's never a best practice for a charity to put people to work if they can't provide appropriate supervision/training, or when they just don't have anything they need help with, but there are lots of ways to help if you can't give $. Sometimes, I am really glad to have reviews stored up, because as I write this, Amazon Associates is down. I don't link to books in a way that you are buying them and giving me a kickback (at the time of this writing, anyway), but I do love the widget for book covers. How Tia Lola Came to Visit Stay by Julia Alvarez (Random House - Knopf) is about two kids (but mostly about the older brother) who move to upstate New York when their mom and dad get divorced, and mom brings her sister Lola from the Dominican Republic to live with them during the transition. This is Tia Lola; I'm missing the accent, but Tia Lola is Aunt Lola. See how I just let on that this is a translated term without going all "...someone said, which means aunt in Spanish"? This book has a lot of Spanish text in it. Repetitious, perhaps, if you're completely fluent in both languages--or maybe interesting, as you compare the subtleties in what is and isn't always conveyed--but it's very appropriate that this book is bilingual, given that its characters are (and sometimes aren't) and that its characters are dealing with biculturalism (and I'm using that term loosely), moving between cities, countries, cultures, and other split situations. Tia Lola is sometimes an embarrassment, sometimes magic (figuratively, not literally), always family, and I think this is an awesome book that I’d have read in one sitting if I’d had time for sitting when I was reading it. Beware, however: I read this as an e-book and the formatting is so awful I was not always sure what was going on. It’s an utter mess. I don't think anyone looked at it. It's not just the characters needed for Spanish, it's everything. On the up side, there are sequels! A good middle grade read about family. By the time you read this, I'll be out of the country for a bit; I found this while scouring and shutting down an old blog. If you've participated in an online fan community, you know how easily, and how frequently, people use those interests and relationships to scam others, even though most people are kind and trustworthy. When a Fan Hits the Sh*t by Jeanine Renne chronicles the Bit of Earth scandals of 2003ish and thereabouts. I didn't pay too much attention to this at the time it was going on, not being in the Lord of the Rings fandom--and besides, even in book form, the story is very convoluted and confusing. The book starts by jumping back and forth between the beginning and end of the story, alternating chapters. If I'd known the players better, I'd have liked that more. It would make great cinema, but it's a little confusing, though I did figure it out. Something else: stories and parts of stories get repeated several times throughout, but I think the book had to be done that way; sometimes, the time-shifting is necessary to explain a certain specific happening, but telling the whole story at that point in the book is either unnecessary or confusing because other details can't be revealed at that juncture. The basic story is this: A 19-year-old girl named Amy Player goes on the internet and adopts the pseudonym Victoria Bitter. Victoria Bitter writes slash. VB channels hobbits. VB gets fangirled, and when she's (supposedly) hospitalized and at her worst, Abbey "Orangeblossom" writes her a poem. It is the beginning of a very strange relationship. Later, Abbey leaves her husband and gets involved with a boy named Jordan Wood. Abbey and Jordan are major players in Bit of Earth, which is both a website and a wanna-be charity. They are at the helm of a big line party for LotR II, build a children's reading garden with Sean Astin, and go on to organize film festivals and band festivals and even a fan convention. OR DO THEY? Not to spoil anything, but nope. We even get into e-mails (e-mail is forever!) where we find that Jordan Wood and Abbey lied and manipulated some otherwise smart folks, including publicity agents and stars, that money disappeared, and that others were continually covering their asses in terms of events that were canceled and fell apart, including the fan convention that had only 28 tickets sold. There are fake suicide attempts, phony donations to charity, manufactured realities, and a detective who wants to know what happened to Amy Player. It's a fascinating read for people interested in scams and fan interaction. Like the reviewers on Amazon say, it's almost too strange to be true. As a side note, this story is about real people who do still appear in the online world, and that have had other stories and criticisms leveled at them in the years since, probably easily found through your favorite search engine. And as a side note, as I'm out of the country and unable to moderate any discussion, I'm turning off comments on this post. I read Guardian of the Spirit (Moribito) by Nahoko Uehashi (Scholastic) last March--right at the height of the news about the earthquake and following disasters in Japan, and right in the middle of the debates in children's blogging circles about reviews, and whether or not anyone who was interested in publishing, at all, ought to write "bad" reviews. (The scare quotes are because there really wasn't a single definition of bad, and some of the example reviews, well, I didn't think they were all that bad...) I ended up writing this, explaining my position, but I didn't want to post this review at the time. I felt bad for anyone with a direct connection to Japan, vaguely guilty that I kept buying travel guides to different countries and that they all had huge natural disasters right after I did so, uncomfortable because I love the IDEA of this book so much. So, let me outline in brief why I didn't enjoy it, but why I still recommend it. Guardian of the Spirit is the first in a series of popular Japanese books that have been (maybe are being) translated into English. They follow Balsa, an adult martial artist. She rescues Chagum, the son of the Mikado, and is then tasked with keeping him safe from the father who would have him murdered--as well as an ancient, mysterious monster that only shows up every hundred years. On a personal level, I often struggle with books in translation; I often find them flat, or rough, or awkward. So it's maybe no surprise that I felt this way about Guardian of the Spirit; at the same time, I know that it is very difficult to translate from language to language, and I think most of the issues I had were rooted in the original. There's a lot of telling where I wished for showing, a lot of coincidental or sudden revelations without support in the text, for example, and I wished for more emotional connection to Balsa and Chagum. I also felt a little adrift, because the story has one adult and one child point of view, but I didn't feel like the story was really middle grade or adult, and that it also wasn't universal enough to be all-ages--a very silly complaint, and one that puts too much faith in marketing categories to encompass everything readable, I know, but I can't quite articulate why this didn't grab me there. Finally, this seemed to me to read like a novelization of anime (maybe manga); the pacing and conventions of anime are there, but they didn't seem to work on the page as compared to how they would have worked on the screen. I was missing the quirk of a mouth, the sparkle in the eye, the wind of chi that accompanies a visually stunning battle. The story is available as an animated series, and I suspect I'll like that more than the written version. Maybe it's unfair to not give more leeway for a different storytelling style, and I admit that, and maybe I'm too tied to my ideas of how things should work. I'm still thinking about this, months later, and I'll be thinking about it when this posts in November, when I'm halfway around the world. But now I will tell you why I feel an affinity for Guardian of the Spirit anyway. I love that this book is...chancy. Risky. It's not a marketing category fit; books aimed at/marketed to younger readers rarely have an adult heroine at the heart. Sometimes marketing categories fit, like any other classification system, and help us make decisions and generalizations, but I also like when things break the mold. I like that this book exists at the same time as the animated series does; there's potential for fans of one or the other to cross over. Readers get to experience a particular style of storytelling, and watchers get to reinforce the story by reading it. I really appreciate the care taken in packaging Guardian of the Spirit. There's beautiful art, beautiful chapter headings, and a hint at the visuals that would go with the story. It's "just" a paperback, so that didn't have to be done, but it was anyway. It is always good to have more diversity in the books available--for all ages. I could give all sorts of additional thoughts there, but I think that I'll leave it at that today. Despite my personal quibbles, I'd hand this to children age 8-12, probably, first, and I think this is a good read for people who like adventure stories. If I were working with middle grade or young adult readers, I'd have this in my library. This YA-marketed nonfiction book traces the world history of sugar and the industry’s ties to things like slavery, Caribbean/Hawaiian economics, Ghandi, immigration, and so on. One of the weirdest things I took away was the idea that during the so-called Dark Ages, Europe was not the superpower in the world that it is today, and that it was busy treating its own like dirt. I like histories like this that tie together things I know about, and I learned a lot and got a better idea that some things were happening simultaneously in history, but I also think that in their enthusiasm, the authors, particularly in their wrapup/conclusion, gave sugar a little more credit for the world’s woes and triumphs than it might deserve. Before I talk about this read, I want to note that I read it back in February and stored the review for November because I'll be spending the next few weeks on vacation. I'm very excited, but I don't know how much reading I'll get done while I'm away! I can't believe that I hadn't read anything by Maureen Johnson before Devilish (Penguin - Razorbill). This one gets both a fantasy and a science fiction tag, because it's the sort of story that doesn't fit neatly into either bookstore shelf. Jane's friend Allison is a little, well, bumbly. Jane's been getting her out of scrapes forever, it seems, but one day, just a day after all the girls at their Catholic school witness Allison's mishap (which involves puking), Allison seems to have gotten it together. So together, in fact, that there are mysterious phones and clothes and other nice things. A little investigation and Jane figures out that Allison is sold her soul to the devil, and Jane, like always, will do whatever it takes to help her best friend. It's a little funny to read this so long after it first came out. I can see shadows of today's YA, a genre that has really exploded in the meantime. One shadow: the book clocks in at about 250 pages. Today, it would be a hundred pages longer. (Maybe not the end of the world, even though I gripe about books that are too long for the stories within; I'd have liked to know more about Jane and Allison's friendship.) Also, I don't want to spoil anything, but there's a romance that presages a certain best-selling paranormal in a fairly funny way. If you're looking for paranormal with a dose of humor and a dearth of angst, give this a look.